LONDON--(BUSINESS WIRE)--Technavio’s latest market research report on the global instant coffee market provides an analysis of the most important trends expected to impact the market outlook from 2018-2022. Technavio defines an emerging trend as a factor that has the potential to significantly impact the market and contribute to its growth or decline. 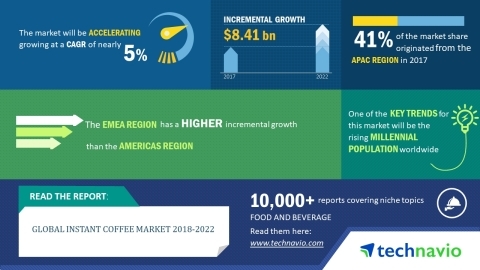 According to Technavio market research analysts, the global instant coffee market will grow at a CAGR of almost 5% during the forecast period. The increasing number of new product launches is a major factor that has been driving the growth of the market. Over the last few years, there has been an increase in the number of new product launches by several major vendors in the market. This is proving to be a key driver that is promoting the growth of the global instant coffee market. Vendors have been constantly working on launching innovative products to attract customers. The consumption of instant coffee is very popular among millennials because they try out new variants and flavors more when compared with older people. In 2016, the millennials accounted for nearly 25% of the global population. Correspondingly, the US, one of the largest instant coffee markets in the world by revenue, had around 75.6 million millennials in 2016. Apart from this, the rising millennial population in Europe is an encouraging sign for the global instant coffee market as they form the largest consumer segment of the instant coffee-based products. “The rising disposable income of consumers in developing countries such as India, where the millennials accounted for nearly 29% of the total population in 2016, is encouraging the instant coffee vendors to expand their geographical presence and increase their customer base. China, which is the world's second-largest country by millennial population, has already been under the instant coffee revolution since the last five years. It is also projected to be one of the fastest growing markets for instant coffee-based products during the forecast period,” says a senior analyst at Technavio for research on non-alcoholic beverages. This market research report segments the global instant coffee market into the following products (spray-dried instant coffee and freeze-dried instant coffee) and key regions (the Americas, APAC, and EMEA). The spray-dried instant coffee segment held the largest market share in 2017, accounting for more than 67% of the market. The market share for this segment is expected decrease slightly by 2022. However, this segment will dominate the market throughout the forecast period. APAC was the leading region for the global instant coffee market in 2017, accounting for a market share of close to 41%. The market share of this region is anticipated to increase by nearly 5% by 2022. APAC will dominate the market throughout the forecast period. Technavio’s latest market research report on the global instant coffee market provides an analysis of the most important trends and drivers.